Highland’s Makenna Belcher prepares to serve the ball in her team’s straight-set win over Northmor Thursday. Northmor’s Leslie Brubaker puts a hit on the ball while teammate Anna Donner (#22) also is in the area on Thursday. 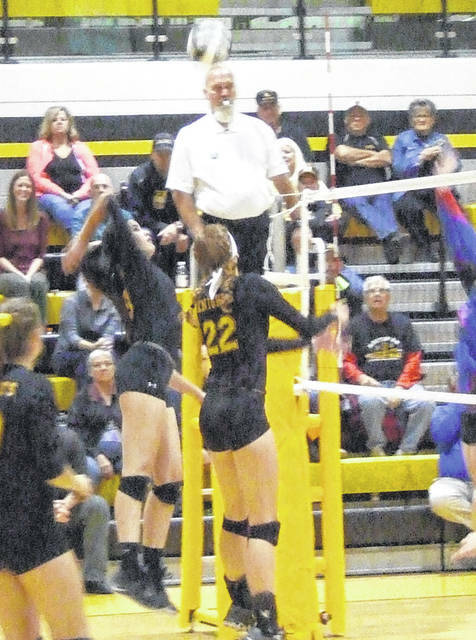 After getting off to a slow start at Northmor in Thursday night’s regular season finale in volleyball, Highland turned on the jets and wound up claiming a 25-19, 25-7, 25-21 win to spoil Senior Night for the Knights. Northmor jumped out to a fast start, getting two points each from Anna Donner and Madison Hoverland and three from Aly Blunk as they opened up a 12-5 lead in the opening set. However, the Scots got a defensive point and then tallied 10 straight points on the serve of Kelsee Bargnesi to surge past Northmor and take a 16-12 advantage. After that run, Northmor could only score one more offensive point on a serve by Lily Tate. Meanwhile, the Scots got one from Makenna Belcher and two from Darcie Walters to wind up winning 25-19. Pretty much everything went Highland’s way in the second set. Northmor had issues early on with their line-up and the Scots then dominated the action on the court. Makenna Belcher opened the set with four straight points. After the Knights scored once on the serving of Macy Miracle to get within a 4-2 margin, the rest of the game was all Highland. Ashlynn Belcher tallied two points, Bridget Oder scored four, Walters contributed one, Bargnesi had four and Makenna Belcher finished the set by adding another four to give her team a decisive 25-7 win. 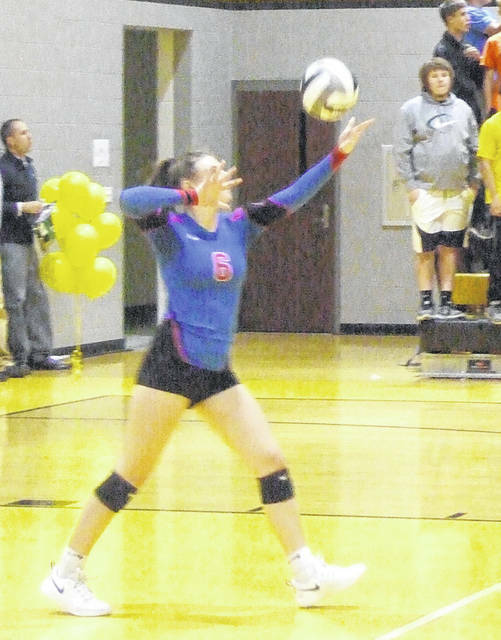 The third game was closely contested, but the Scots were able to hold the lead for most of the way, as one point each from Bargnesi, Kendall Stover and Ashlynn Belcher and two each from Makenna Belcher and Oder staked them to a 15-8 lead. While Northmor got within a 19-16 score on two points each from Donner and Blunk and one from Hoverland, they would not be able to get over the hump. Trailing 24-19, they got two from Hanna Bentley, but a defensive stop by the Scots provided the 25th and final point of the set. Terrill noted that his team has done a good job getting geared up for the playoffs with a number of impressive wins to close out the regular season. The Scots have now claimed six straight titles between the MOAC and KMAC — six years in which they haven’t lost a single match in league play. The Scots got 15 kills from Makenna Belcher and 13 from Raina Terry. Both Ashlynn Belcher and Stover added five kills and Bargnesi finished with three aces. For Northmor, both Donner and Leslie Brubaker had six kills. Donner added five assists and six digs, while Brubaker added two blocks. Julianne Kincaid had four kills and three blocks and Miracle contributed three kills, four assists and two blocks. Also, Tate had two assists and six digs, Blunk had 10 digs and Hoverland added six digs. Wright is now looking to regroup for the postseason, noting her team has hopes of improving on last year’s performance.